My cat often chirps at me when I get home. Why does he do that? What's he saying? Oh, how nice that your cat chirps to you! He's saying "welcome home!" Not all of us do that (I don't), and you should feel very honored! When we talk to each other, we usually use body language. We talk with our eyes, ears and tails. But since humans don't seem to understand our native language, we make sounds, like your cat's chirp, to communicate with you. I didn't know this until my human typist did some research. Next to birds, we make the widest range of sounds of any domestic animal companion. How cool! Purring. Well, you know your cat purrs when he's happy and contented. But what you might not know is that cats sometimes purr when they're in pain. Chirping. We chirp at our humans as a greeting (Your cat might put his tail up at the same time). We might also chirp to get your attention when we see something really interesting we want to share. Chattering. We usually do this when we see something outside and are frustrated that we can't get to it and catch it. Growling and snarling. These aren't good. They mean your cat is scared or angry, and it's best for you to just stay away. Hissing. A hiss is a warning to other animals or people to not even think about coming close. Yowling. In cat-to-cat communications, yowling is a mating call. But it can also be an indication of your cat's health. 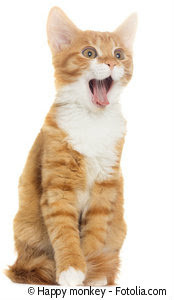 Cats yowl when they're losing their hearing or when they become forgetful and confused. Hyperthyroid cats yowl sometimes. Grief can sometimes cause yowling, too. A cat who's been relocated to a new home might yowl at first because she's so unhappy. Caterwauling. I hope your female cat's spayed so you'll never hear this sound. 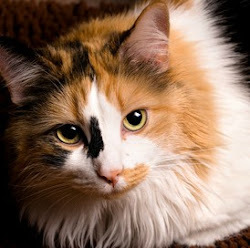 Female cats caterwaul or call when they're looking for a mate. Screaming. I hope you'll never hear this sound, too. Cats scream when they're about to fight. This ear-piercing shriek is upsetting to everyone who hears it. We make the same sounds in different ways, depending on the mood we're in, too. So a quiet meow might mean we're just feeling chatty, while a loud, persistent one is your cat's way of telling you he's really hungry or really mad. Here's a video of some of the sounds cats make. Hope you enjoy it!